Real IT Solution Review 2019: Is Real IT Solution a Good Hosting? 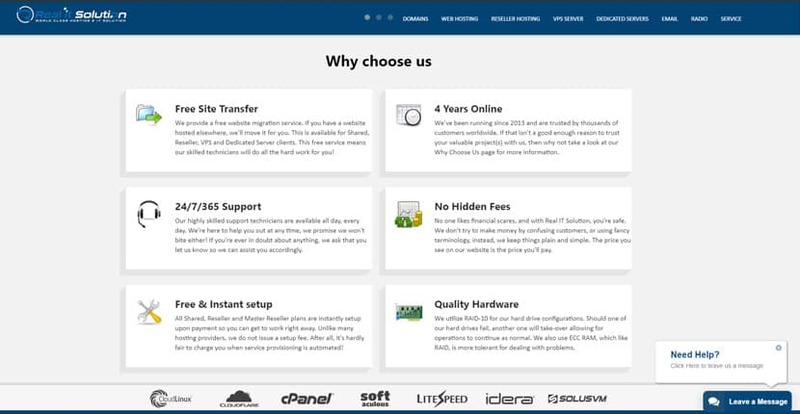 Though they aren’t the biggest players in the Bangladeshi web hosting space, Real IT Solution has carved out a reputation for themselves as an affordable yet reliable web hosting provider. They have a range of hosting solutions from budget SSD shared hosting to dedicated servers. Real IT Solution is a web hosting company founded in 2013 and based in Bangladesh. This hosting provider offers a range of budget and premium shared hosting solutions, reseller hosting, VPS hosting, and dedicated servers. Though they aren’t the biggest players in the Bangladeshi web hosting space, Real IT Solution has carved out a reputation for themselves as an affordable yet reliable web hosting provider. I liked that they included unlimited databases and subdomains even with their most basic plan; many other providers will restrict the number of databases you can have if you’re on an entry-level plan. However, what I didn’t like as much was that they only provide a free domain registration with their higher-tier plans, and only one with a .xyz extension at that. Given that this is a rarely-used extension, it’ll be harder for their customers to carve out a thriving web presence unless they choose to purchase their own top-level domain. Real IT Solution uses a RAID-10 hardware configuration designed such that when one hard drive fails, another one automatically takes over its operations. This is an appealing feature for businesses that cannot afford any downtime. The vendor also uses LiteSpeed Web Server to achieve premium speeds for the websites in their purview. Real IT Solution’s plans are very cheap, though they have notable restrictions in the features they include. For instance, their Starter plan only gives you 500MB SSD storage and 5GB bandwidth, which is just enough for a simple and mostly-static website, but not enough if you plan on running a popular blog or business website. Furthermore, only their higher-tier hosting plans include a free domain registration, but few webmasters would be interested in the .xyz domain extension offered. New users have a 20-day money back guarantee if they’re unsatisfied with the hosting solutions this vendor provides. However, this is lower than the industry standard of 30 days. Real IT Solution is ideal for small and medium-sized businesses. The vendor’s low cost hosting makes it perfect for startups and businesses with a limited budget. Wondering how Real IT Solution stacks up against other Web Hosting companies? Enter any other Web Hosting company and we will give you a side-by-side comparison.